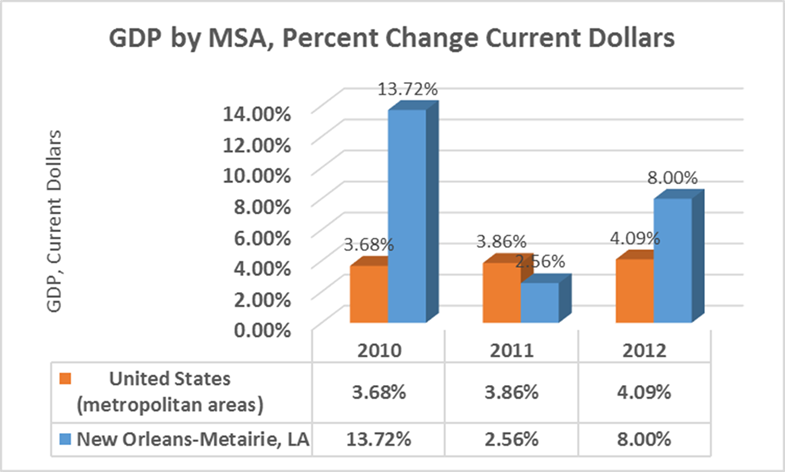 Just out today is the Bureau of Economic Analysis report on GDP by MSA, showing last year the New Orleans-Metairie economy grew almost twice the average pace at 8.0% compared to the U.S. at 4.09%. The New Orleans MSA was one of 305 Metropolitan Statistical Areas that experienced positive real growth in Gross Domestic Product in 2012, out of 381 MSA’s. Durable-goods manufacturing continued to spur growth in many of the nation’s metropolitan areas in 2012. Strong contributions from this industry fueled growth in many small metropolitan areas where it constitutes a large portion of the area’s economy.4 This is especially true in the Great Lakes region where durable-goods manufacturing contributed 8.5 percentage points to growth in Elkhart-Goshen, IN, 8.3 percentage points to growth in Columbus, IN, and 7.2 percentage points in Kokomo, IN. Elkhart-Goshen, IN and Columbus, IN were two of the fastest growing metropolitan areas in 2012, with overall real GDP growth of 11.4 percent and 9.6 percent, respectively. 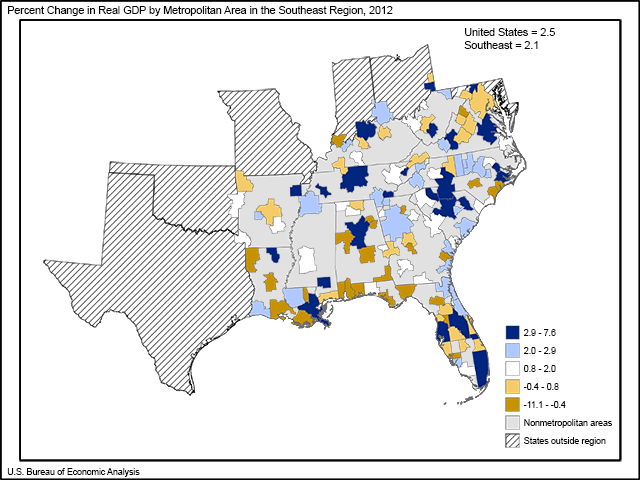 Real GDP expanded in 86 of the 114 MSAs wholly contained in the southeast region. Durable-goods manufacturing contributed the most to growth in real GDP for the region. This region accounts for 18.7 percent of the nation’s current-dollar GDP in durable-goods manufacturing. By contrast, government restrained growth in the region’s GDP.
? New Orleans-Metairie, LA and Lake Charles, LA experienced the largest upturns in real GDP growth due to a concentration in mining and nondurable-goods manufacturing, respectively. New Orleans-Metairie, LA growth improved to 7.6 percent in 2012 from –5.6 percent in 2011 (13.2 percentage points), while Lake Charles, LA growth improved to 2.5 percent in 2012 from –7.1 percent in 2011 (9.6 percentage points).
? Growth in real GDP ranged from –11.1 percent to 7.6 percent with the fastest growth occurring in New Orleans-Metairie, LA and Greenville, NC. Growth in each of these metropolitan areas was spurred by mining and nondurable-goods manufacturing, respectively.
? Atlanta-Sandy Springs-Roswell, GA and Miami-Fort Lauderdale-West Palm Beach, FL—the two largest metropolitan areas in the region, and the 10th and 11th largest in the nation—experienced growth (2.6 percent and 3.5 percent, respectively), due to growth in information and real estate, rental, and leasing, respectively. GDP is the Gross Domestic Product, or the sum of goods and services produced inside the Unites States. It differs from GNP, Gross National Product which allocates production based on ownership. 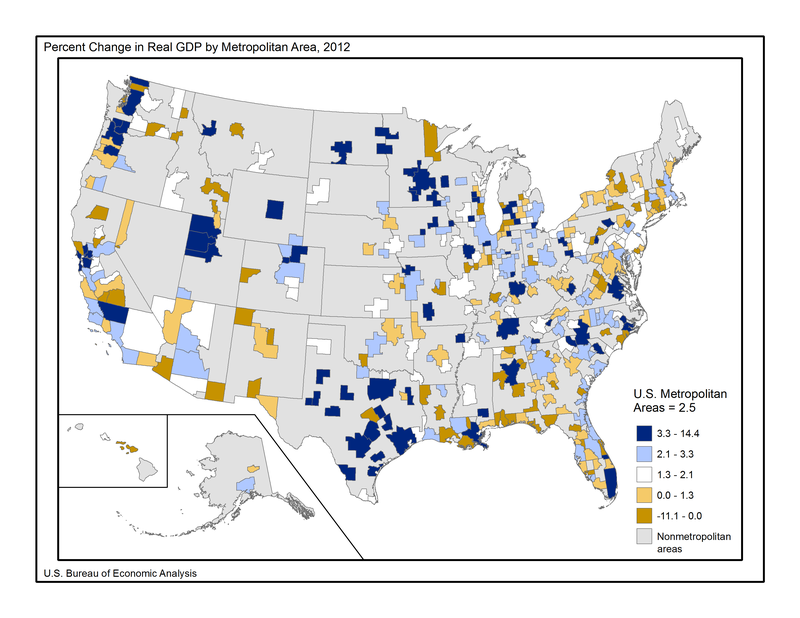 GDP by metropolitan area is the sub-state counterpart of the Nation’s gross domestic product (GDP), the Bureau’s featured and most comprehensive measure of U.S. economic activity. GDP by metropolitan area is derived as the sum of the GDP originating in all the industries in the metropolitan area. GDP can be determined in three ways, all of which should, in principle, give the same result. They are the product (or output) approach, the income approach, and the expenditure approach. The most direct of the three is the product approach, which sums the outputs of every class of enterprise to arrive at the total. The expenditure approach works on the principle that all of the product must be bought by somebody, therefore the value of the total product must be equal to people’s total expenditures in buying things. The income approach works on the principle that the incomes of the productive factors (“producers,” colloquially) must be equal to the value of their product, and determines GDP by finding the sum of all producers’ incomes. Note: “Gross” means that GDP measures production regardless of the various uses to which that production can be put. Production can be used for immediate consumption, for investment in new fixed assets or inventories, or for replacing depreciated fixed assets. “Domestic” means that GDP measures production that takes place within the country’s borders. In the expenditure-method equation given above, the exports-minus-imports term is necessary in order to null out expenditures on things not produced in the country (imports) and add in things produced but not sold in the country (exports). Current dollar GDP is the actual number, quoted here in millions, and the Real Dollar GDP is adjusted for inflation. The statistics of real GDP by metropolitan area are prepared in chained (2005) dollars. Real GDP by metropolitan area is an inflation-adjusted measure of each area’s gross product that is based on national prices for the goods and services produced within the metropolitan area. The statistics of real GDP by metropolitan area and of quantity indexes with a base year of 2005 were derived by applying national chain-type price indexes to the current-dollar GDP-by-metropolitan-area values for the 61 detailed NAICS-based industries. What is the New Orleans MSA? The metropolitan (statistical) areas used by BEA for its entire series of GDP statistics are the county-based definitions developed by the Office of Management and Budget (OMB) for federal statistical purposes and last updated in February 2013. OMB’s general concept of a metropolitan area is that of a geographic area consisting of a large population nucleus together with adjacent communities having a high degree of economic and social integration with the nucleus. New Orleans–Metairie-Kenner Metropolitan Statistical Area, or the Greater New Orleans Region (as it is often called by the Louisiana Tourism Commission) is a metropolitan area designated by the United States Census encompassing eight parishes (the Louisiana equivalent of other states’ counties) in the state of Louisiana, centering on the city of New Orleans. As of the April 1, 2012 estimate, the metropolitan statistical area (MSA) had a population of 1,227,096. The New Orleans-Metairie-Hammond combined statistical area (CSA), a ten-parish area, had a population of 1,452,502.